When I have a Bloody Mary, I want it to look like a salad and taste like a steak. Steak and salad, you say? Why, yes. Yes I do. This trend of food in and on the Bloody Mary is not a bad idea! I’ve seen bacon fairly commonly used in the past few years, as well as larger, prepared food items such as pizzas and sliders! I suppose if you can skewer it, you can make it a Bloody Mary condiment. I am all about the multi task and if I can buy a cocktail that doubles as lunch, I can see the value in that. I however, am going to stick to a more traditional style. It will taste like a steak but there will not be a kabob involved! 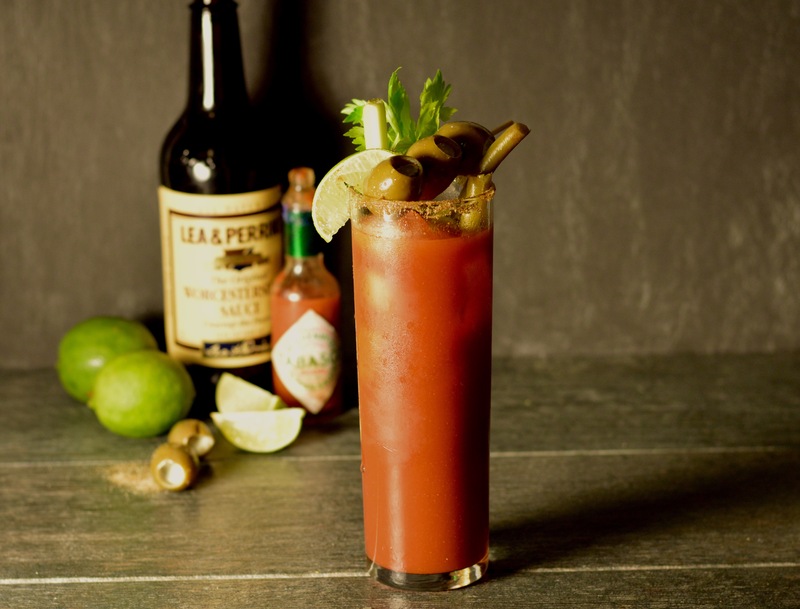 The key ingredient to any Bloody Mary (assuming that tomato juice is a given) is Worcestershire Sauce. I put a ton of it in my mix. Seriously, do not skimp here. 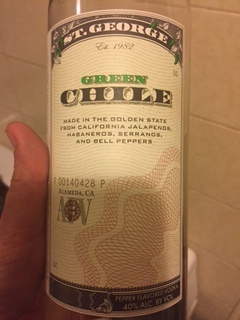 I also kicked it up a bit by using this unique craft green chile vodka by St George. It’s super good and tastes like food. Absolute Peppar would be a great alternative. 1 cup tomato juice. Regular juice is better than a mix here. We are looking to control the flavors. 4 1oz shots of Vodka. These are to make 2 large drinks often served in pint glasses. If you choose smaller cocktail glasses, use 2-3 shots. 1/2 Tbsp celery salt plus more for the rim. 1 lime, you will use the juice of half in the mix and the other half as wedges for garnish. Garnishes! My favorite garnishes are celery, stuffed olives (I used blue cheese stuffed here), pickled green beans, asparagus or okra and a wedge of lime. Add all ingredients except garnishes and vodka to a shaker and mix vigorously. Set aside. Pour a bit of celery salt into a saucer and wet the rim of the glass with a lime wedge. Gently run the rim through the salt. Fill with ice. Measure vodka over two glasses and top off with the Bloody Mary mix. Leave an inch of glass unfilled to accommodate your garnishes. Give it a quick stir with a long spoon and add garnishes. Voila! A fantastically perfect Bloody Mary! Tastes like a steak, looks like a salad. Perfect for a hair of the dog moment and whatever else ails ya! Enjoy! Swearing Mom out.